There have been many stories from the Second World War. Some are familiar from books and movies or have become legends. Others are yet to be written down. I am David Isby. 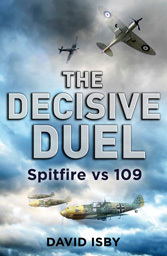 I have written THE DECISIVE DUEL as a “dual biography” of the British Supermarine Spitfire and German Messerschmitt Bf 109 fighter aircraft of the Second World War. The stories of these two aircraft are not just about technology and performance but about the people whose lives were touched by them. The parallel and intertwined stories include brilliant aircraft designers, resolute air marshals, and skilled fighter aces, to be sure, but also people that were thrust into these stories by the events of a global war. All have extraordinary stories of courage and endurance. I know this because some of them were my family, and it was their stories that inspired me to write this book. THE DECISIVE DUEL starts with the origins of the aircraft and their designers. It ends in the present where, at places such as the Imperial War Museum’s Duxford airfield, a few surviving Spitfires and 109s still fly, even as those that built, flew, and maintained them fade away. The story of how this came about is THE DECISIVE DUEL.